An absolutely wonderful salad, this had just the right mix of vegetables and crunch to satisfy anyone. The dressing adds just the right amount of salty sweetness. In a small saucepan, combine all of the dressing ingredients. Heat, stir well but do not boil. Turn off the heat, let cool, and allow the salad dressing to sit for at least 30 minutes before using. Heat a medium size skillet over medium high heat. When pan is hot add the canola oil, sesame oil, and the ramen noodles, stir 1-2 minutes. Add the almonds and sesame seeds to the ramen noodles, stir well until toasted and crunchy, but do not brown. Set aside until ready to use. 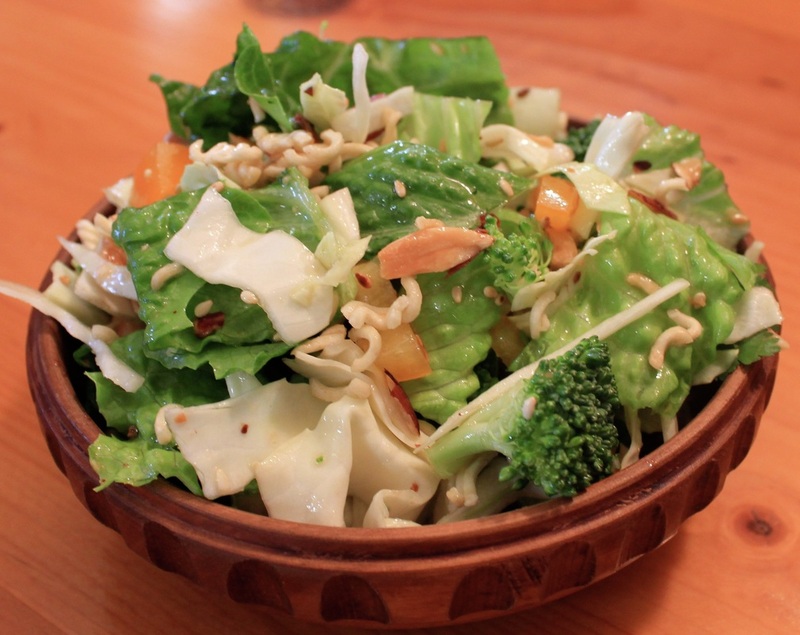 In a large salad bowl, combine the cabbage, romaine, broccoli, cilantro, green onions, and bell pepper. When ready to serve add the almond mixture and the dressing to the salad, mix well.